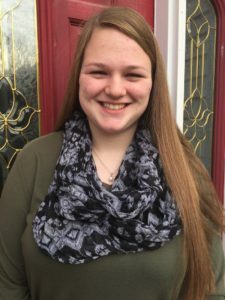 Emma Sked, a junior at Lyme-Old Lyme High School (LOLHS), has been appointed to the Governor’s Prevention Partnership Youth Council. She is one of eight Connecticut youth selected through a competitive application process to serve as a member of this statewide organization whose mission is to help prevent underage drinking and substance use, prevent youth violence and bullying, and promote youth mentoring and peer to peer interactions. Emma is the daughter of Elizabeth and Ken Sked of Old Lyme. Since her freshman year, she has been an active member of the Lyme-Old Lyme local prevention council, Community Action for Substance Free Youth Coalition (CASFY). Emma serves as CASFY’s Youth Advocate, taking a formal role in leading youth prevention projects with the Lyme-Old Lyme High School club REACH (Responsible Educated Adolescents Can Help), and participating in all aspects of the coalition. Emma’s work with the Lymes’ Youth Service Bureau and CASFY created the opportunity for her work on prevention at the state level. Emma’s activities at LOLHS include serving as a member of the Student Advisory Council, Student Leaders, Community Service, Spanish, Amnesty International clubs, and varsity softball. She is an Honor Roll student and has received awards in multiple subjects for academic excellence. Emma also works after school at the Old Lyme Children’s Learning Center.